The start of the new school year is just a few weeks away. Even though it’s still summer, I spend a portion of each day preparing for what’s ahead. My preparation includes the usual things: selecting curriculum, creating reading lists, planning trips, and sifting through extracurricular options. But this year, I’m also taking time to do some personal preparation as well. I want to start the school year with the right mindset, so I’ve been reflecting upon the previous school year and thinking about ways to become a better homeschool mom this school year. The result of my thinking can be summed up in this list of suggestions. 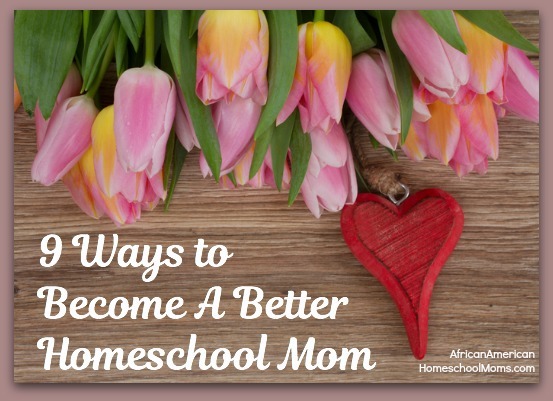 If you’re interested in becoming a better homeschool mom this year, perhaps these nine suggestions will enlighten and encourage you. 1. Be spontaneous. We all know that planning ahead is one of the keys to homeschool success. It gives us focus and brings us peace of mind. However, taking time to enjoy an unplanned activity can be purposeful as well as fun. These last minute outings may become the highlights of the school year. Every once in a while, it’s good for us to step off the well planned path and take time to enjoy something unexpected but awesome. 2. Connect with other homeschool families. Homeschooling can be a lonely journey, but it doesn’t always have to be. When we establish connections with other homeschool families, we become part of a likeminded community and experience the joy of new friendships. If face to face connections are difficult, we can seek out online groups or forums specifically created for homeschool moms. Through these connections we can share homeschool joys and seek answers to our homeschool dilemmas. 3. Maintain realistic expectations. Our desire to raise knowledgable and successful children drives our curriculum choices and helps determine the extracurricular activities in which our children will participate. Because there are so many excellent activities and courses to choose among, our excitement may lead us outside of the realm of what’s humanly possible. In order to maintain good mental health, we should avoid taking on too many responsibilities and fight the urge to create overwhelming weekly schedules. There are only 24 hours in each day and we have to be realistic about how we spend those hours. 4. Exercise your right to say no. We can’t let other people, even those with good intentions, dictate our schedules. Caving in to pressure or giving in to guilt means we may end up taking on tasks we don’t want or don’t have time to tackle. It’s well within our right to say no to a teaching assignment at co-op or to decide against serving as the host of the weekly homeschool science club. Saying no today may prevent stress tomorrow. 5. Refuse comparisons. Most of us know that one homeschool mom who is always doing something amazing with her kids. Many of us have visited that one homeschool Pinterest board chock full of fantastic homeschool activities. Sometimes these encounters leave us feeling as if we’re not doing enough for our own kids. Don’t compare your homeschool to anyone else’s homeschool. Each one of us is on our own unique homeschool journey, one that is just right for our family. Let’s refrain from using another mom’s yardstick to measure our homeschool success. Instead, let’s choose to appreciate the beauty of our individual homeschools. 6. Relax. We’re moms and we want to give our children the best. However, sometimes in our quest for the best, we get worked up and let the What Ifs run rampant in our minds. What if she doesn’t learn to read until age 6? What if I have to switch math curriculum midyear? What if we fail to complete all of the science experiments? Don’t worry, dear sister. It will be okay. Just relax and continue to move forward. 7. Place relationships before rigor. The ABCs and 123s are important, but they’re not more important than our relationships with our children. Homeschooling is about more than facts and figures. If our kids are full of facts, but lack the joy of fulfilling family relationships, we have missed the mark. During our homeschool days, let’s be intentional about strengthening the relational bonds between parents and children and among siblings. 8. Stop beating yourself up. We all make mistakes and we can’t do everything. But in spite of our shortcomings, the Earth continues to rotate and each day is a new one full of opportunity. Beating ourselves up over the past isn’t a good use of our time. In fact, doing so can lower our self-esteem and decrease our productivity. When we make a mistake or slip up in other areas, we can choose not to dwell upon it. Instead, we can learn from the mistakes, endeavor to do better, and best of all, move on. 9. Take care of yourself. When was the last time you had a physical? Is it time for a mammogram? Are you ignoring health issues because you don’t have time to make personal appointments? Are you eating well? Do you exercise regularly? Are you getting enough sleep? Yes, we are busy women, but we have to make time for self care. Heart disease, stroke, and depression are real. We can’t give our kids what they need, if we haven’t gotten what we need. Every single day we should take time to care for ourselves. Our families will be blessed by our efforts. So glad you were encouraged! Welcome to the wonderful world of homeschooling! May your first year of homeschooling be happy and blessed.